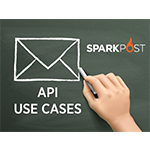 This past week, SparkPost released its long-anticipated enhancement to our API: individual recipient-level Message Events. While it has been possible to get individual recipient-level data via webhooks since we launched back in April, this feature provides users with an additional mechanism to get message events data. This new API endpoint provides our customers a way to pull data – on demand – for use in internal reporting, triggering message generation, or other programmatic processing of event data. * Message events data is available for 10 days. Of course, rolled up data is available via our metrics endpoints or the UI reports for much longer. So what kinds of can you do with the message events? If the recipient received the message — and maybe even opened it, the customer service rep can provide a time/date to help them find it. Inboxes are pretty full these days — it’s easy to lose messages. Use the data to build a customer profile database — who’s engaged (opened / clicked within 90 days), who isn’t, and use that to drive additional messaging. You could further break it down by campaign — are certain users more responsive to certain campaigns than others? This is the foundation for segmentation analysis. curl -XGET -H ‘Authorization: <your key>‘ https://api.sparkpost.com/api/v1/message-events?events=open,click&from=2015-09-02T00:00&to=2015-09-02T23:59&timezone=America/Chicago. Take it even further and tie it to existing data you already have about the recipient, such as purchase history or website data, for a richer profile. How will you use message events? Tell us in the comments.